Increasingly the population began to voice its discontent, not only with the military reverses, but also with the domestic hardships which were directly attributed to the government’s incompetence The short-lived mood of national solidarity at the outbreak of war had now evaporated. Industry was battered by a renewed wave of strikes. Most members of Russia’s upper classes, who at the start of the war had rallied behind the government, were now united in opposition to it. In the Duma and in the voluntary organizations, such as the All-Russian Union of Zemstvos and Cities and the War Industries Committee, and through other networks and connections, they already had the embryo of a new, alternative government without the tsar. A constitutional crisis was threatening to paralyze Russia’s war effort. But the ruling classes hesitated to take that last step alone. The final push came from the streets of Petrograd. On 22 February 1917 a lockout at the giant Putilov metalworks brought many metal-workers into the streets. Next day large numbers of women textile-workers, concerned with mounting food shortages, went on strike. In the following days demonstrations rapidly spread across the city. 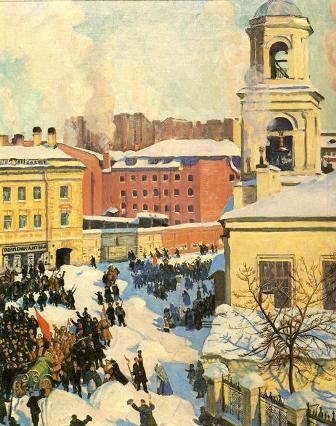 By the end of February 1917 over 80 per cent of Petrograd workers were on strike. They were joined by white-collar employees, teachers and students. The city’s central avenue was flooded with mass rallies and demonstrations, held under the red banners and slogans ‘Down with the tsar!’. All attempts of General Khabalov, the commander of the Petrograd garrison, to maintain order proved futile. On 27 February soldiers of some regiments mutinied and went over to the demonstrators. On 28 February General Khabalov lost control over the situation in the capital completely and felt compelled to order the remaining loyal defenders of the old regime to lay down their arms. Thus, a massive outburst of social discontent erupted in the midst of a losing war and while the economy was beginning to break down, and with the government and the ruling elites locked in a constitutional crisis. Only the combination of these circumstances could lead to a revolutionary explosion which became the February Revolution of 1917. Resolute action, such as promptly bringing in loyal forces from outside the capital, might have saved the imperial government. Instead, with Nicholas II away at the front, authority simply collapsed, the main institutions of government crumbled, and many officials went into hiding. The question now was, which political forces would be daring enough to fill in the power vacuum produced by the crisis. In these extraordinary circumstances, on 27 February, a group of leaders of all parties represented in the Duma met to discuss the formation of a new government which would be able to take the situation under control. A week later, the first Provisional Government emerged composed of a score of prominent Duma leaders and public figures. Prince George Lvov, formerly chairman of the All-Russian Union of Zemstvos and Cities, assumed the positions of chairman of the Council of Ministers (i.e. prime minister) and of minister of the interior. His more important colleagues included the Kadet leader Miliukov as minister of foreign affairs, the Octobrist leader Guchkov as minister of war and of the navy, and Alexander Kerensky, the only socialist in the cabinet - associated with the peasant-orientated Duma faction - as minister of justice. The new government closely reflected the composition and views of the ‘Progressive Bloc’ in the Duma, with the Kadets obtaining the greatest single representation. Thus, the newly created government, although catapulted into power by the action of the revolutionary workers and soldiers of Petrograd, represented the political interests of the middle and upper classes.